Alicia Lewis is the firm administrator and controller for Anderson Jones, PLLC, managing all business and financial aspects of the firm. She has extensive experience in various aspects of law, legal pleadings and research. Prior to forming Anderson Jones, PLLC with Andy Anderson and Todd Jones in 2003, Alicia worked as a paralegal in two mid-sized law firms. 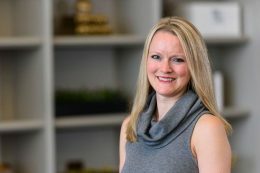 She serves as secretary for the American Subcontractors Association of the Carolinas’ Triangle chapter, and is a member of the North Carolina Bar Association (NCBA). With the NCBA, Alicia is a member of the Paralegal Division, Law Practice Management & Technology Section and the Construction Law Section, where she serves as the Paralegal Division liaison. Also, Alicia currently serves on the Greater Raleigh Chamber of Commerce Professional Women’s Task Force. Her role on this task force helps to further the goal of the Chamber Executive Women’s Luncheon series to bring nationally recognized speakers to the Triangle to address the unique challenges women in management face in today’s business environment. She is also a member of various trade associations that support the construction industry.